Skip the theatre this summer and enjoy your favorite flicks poolside. 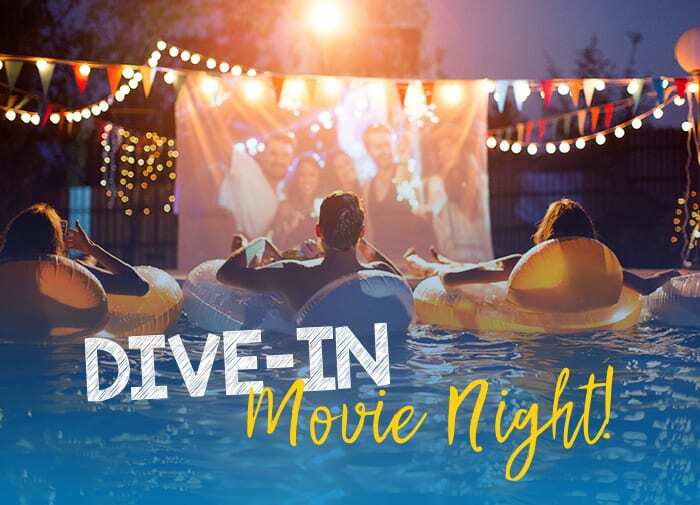 Whether you want to invite the whole neighborhood or make memories with just your family, we’ve put together some essentials and tips to help make the most of a poolside movie night. Backdrop: wall, sheet or DIY screen. Make sure you have the right cables for your laptop or DVD player. Usually, this is HDMI, RCA, or VGA. Tie a rope across the pool so that you can grab or tie to your float in case you start drifting. Make sure the projector is on a large flat surface and away from areas where it may get wet. Stay dry! When the sun sets the temperature will drop, so make sure to have blankets on hand and pool floats or poolside loungers that will allow you to stay dry if needed. Designate a float for snacks and drinks so you can have them close by. Love thy neighbor. Choose a movie that won’t be distracting to your neighbors and respect noise ordinances. Most importantly, make sure to lay back and enjoy the show!